Since last Friday I have been writing about the laundry room makeover project I have been working on, over at Kitsch Designs. Earlier this week I gave more details about the curtain and valance that I created from a vintage laundry bag. You can click here for more information about that project. Now, I would like to let you know more about the skirt that I pulled together to hide the utility sink tub and all it’s ugliness. After an intense scrubbing that involved a heavy duty 3M pad I was able to remove most of the many years of built up gunk from the tub and bring it back to more of a shade of white than super dingy gray. That was the first step in making this thing look better. The other issue was to help hide the bin of cleaning supplies I wanted to keep underneath. Up until recently that bin had been taking up floor space in the hall closet just inside the back hallway from this room to the den. While that hall closet only houses cleaning supplies, including the laundry sorter, I had grown tired of bumping into that bin of clean-up stuff and wanted it moved to a better location. I also did not want to see those items every time I left or came back home, and I did not want the Little Guy to know they were around either. He pretty much steers clear of this area most of the time, but if I have any issues I can just close the door to this space, problem solved! Once I had the tub clean and tidy I took some measurements. First, the width from one back corner to the other and from just below that band that runs around the top edge of the sink tub to the floor. I did not want a cloth skirt that came to the very top edge of the tub because I knew it would get gunked up with spot spray, bleach and just be wet all the time. 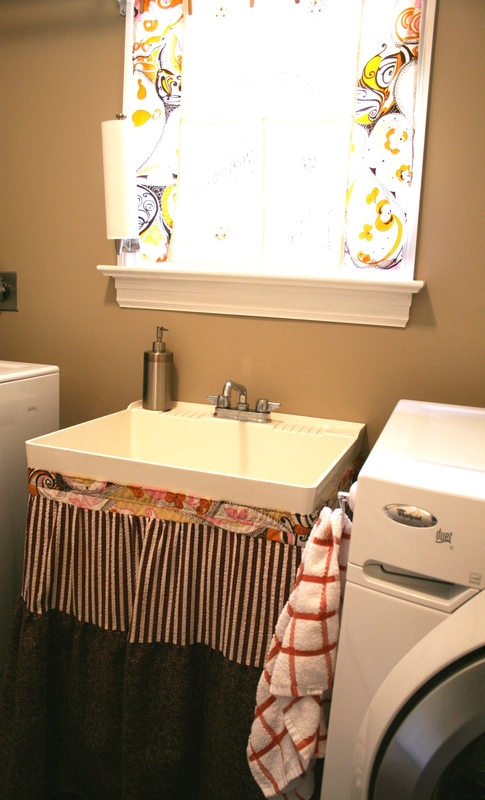 Plus, usually when you see a sink skirt it fits just below the top edge of the sink. Another consideration for the length was to keep it about an inch above the ground. That way I could easily vacuum underneath and hopefully keep that bottom edge from always being dusty. Let’s face it, between tracking dog hair in (the area right outside the door to the garage is her bed and eating space) and the dust bunnies created in any average laundry room that includes a dryer, it’s bound to be a bit fuzzy around here. So, I gathered up some more coordinating fabrics from my vintage stash and started measuring and cutting. I decided to add the darkest band of fabric to the bottom portion of the skirt. Again, this was to help with the inevitable dirt and dust issue. 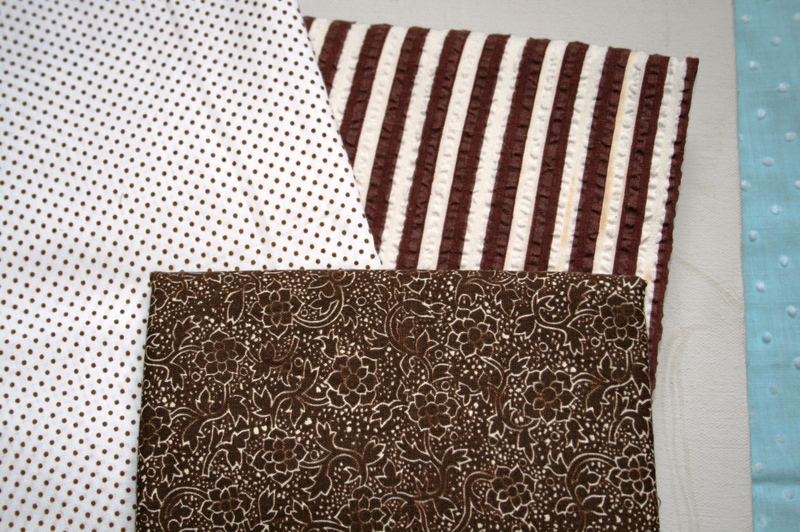 Then I used some of the same puckered fabric with the dark brown and creamy white strip as I used in the valance for the middle band. The very top edge is actually the button placket from the vintage paisley dress that I cut panels from to finish off the curtain. I even considered leaving the covered buttons in place for an added detail, but several were missing their covers and I figured things would be getting snagged on those buttons all the time. 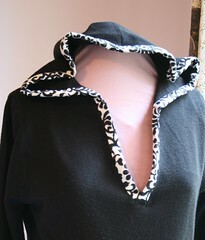 So, although that plan was nixed, the placket made for an easy finish since it was already “hemmed” up. 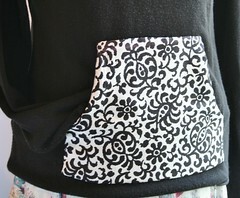 I just attached it to the middle band of fabric, right sides together and stitched. Then flipped it up and over, and stitched along the top edge for stability. The easiest part of the whole project (if it could get any easier) was to add the hook and loop tape for attaching to the sink tub. I had figured I would be buying the regular old stitch in place hook and loop and then gluing one side on to the sink tub. 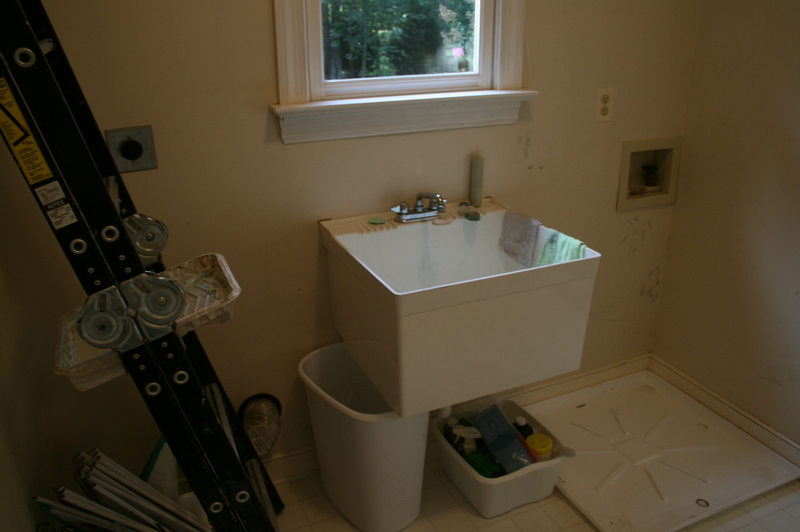 At least, that was the process I had to follow years ago when I skirted a sink in an old rental house The Mister and I lived in long ago. But, times they have changed! Now, they make hook and loop tape in 6 foot lengths with one sticky side and one regular side. It’s funny how something so simple can make one so happy! But, in the instance I discovered this little miracle of a sewing notion I did a quick happy dance right there in the isles of Joanne’s, ETC! My toddler just looked at me like I was insane. What’s new? And, that my friends, was it! I placed the sticky hook side of the tape to the sink tub just below the top of the sink and stitched the loop side onto the top band of the skirt. Then I slapped it into place. 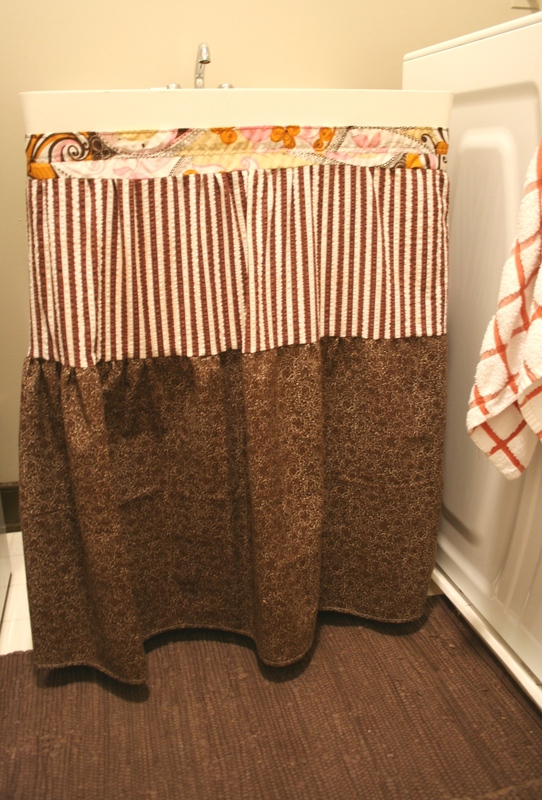 Actually, I folded it in half in an attempt to find the center, eye-balled the sink center and then stuck the skirt there, working along each side to the wall and ensuring a pretty even distribution of tub skirt. So far it has been working quite nicely to fill up the space between the machines and it hides the tub of cleaning supplies well. I also like that it coordinates with, but does not exactly match all the other textile pieces in this space. Well, I guess technically they do match, but they are each a bit unique too. Have you guys ever stitched up a tub skirt? Was it frilly and super girlie, or modest and masculine? I would love to see some pictures! Send them over and I will post!